A VPN gateway connection enables you to establish secure, cross-premises connectivity between your Virtual Network within Azure and your on-premises IT infrastructure. This article shows how to validate network throughput from the on-premises resources to an Azure virtual machine (VM). It also provides troubleshooting guidance. This article is intended to help diagnose and fix common issues. If you're unable to solve the issue by using the following information, contact support. On-premises VPN device (view a list of validated VPN devices). The following diagram shows the logical connectivity of an on-premises network to an Azure virtual network through VPN. Determine your application's baseline throughput requirements. Determine your Azure VPN gateway throughput limits. For help, see the "Gateway SKUs" section of About VPN Gateway. Determine the Azure VM throughput guidance for your VM size. Determine your Internet Service Provider (ISP) bandwidth. Calculate your expected throughput - Least bandwidth of (VM, Gateway, ISP) * 0.8. If your calculated throughput does not meet your application's baseline throughput requirements, you need to increase the bandwidth of the resource that you identified as the bottleneck. To resize an Azure VPN Gateway, see Changing a gateway SKU. To resize a virtual machine, see Resize a VM. If you are not experiencing expected Internet bandwidth, you may also want to contact your ISP. This validation should be performed during non-peak hours, as VPN tunnel throughput saturation during testing does not give accurate results. 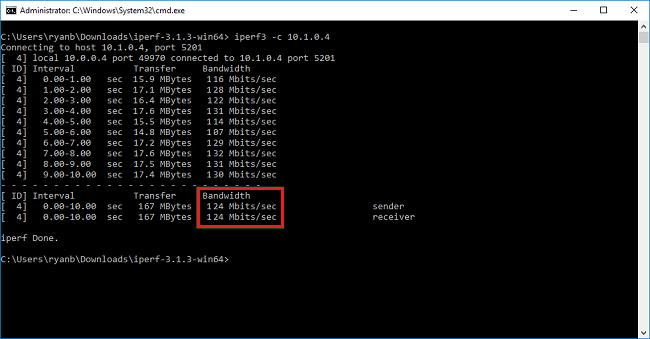 The tool we use for this test is iPerf, which works on both Windows and Linux and has both client and server modes. It is limited to 3 Gbps for Windows VMs. This tool does not perform any read/write operations to disk. It solely produces self-generated TCP traffic from one end to the other. It generated statistics based on experimentation that measures the bandwidth available between client and server nodes. When testing between two nodes, one acts as the server and the other as a client. Once this test is completed, we recommend that you reverse the roles to test both upload and download throughput on both nodes. Download iPerf. For details, see iPerf documentation. Enable an NSG/ACL rule allowing the traffic (for public IP address testing on Azure VM). On both nodes, enable a firewall exception for port 5001. Azure Linux: Azure Linux images have permissive firewalls. If there is an application listening on a port, the traffic is allowed through. Custom images that are secured may need ports opened explicitly. Common Linux OS-layer firewalls include iptables, ufw, or firewalld. The client is inducing traffic on port 5001 to the server for 30 seconds. The flag '-P ' that indicates we are using 32 simultaneous connections to the server node. After completing the previous steps, execute the same steps with the roles reversed, so that the server node will now be the client and vice-versa. File copy applications, such as Windows Explorer and RDP, do not use multiple threads when copying files. For better performance, use a multi-threaded file copy application such as Richcopy to copy files by using 16 or 32 threads. To change the thread number for file copy in Richcopy, click Action > Copy options > File copy. Insufficient VM disk read/write speed. For more information, see Azure Storage Troubleshooting. If the on-premises VPN device Internet-facing IP address is included in the local network definition in Azure, you may experience inability to bring up the VPN, sporadic disconnects, or performance issues. Use tracert to trace to Microsoft Azure Edge device to determine if there are any delays exceeding 100 ms between hops. From the on-premises network, run tracert to the VIP of the Azure Gateway or VM. Once you see only * returned, you know you have reached the Azure edge. 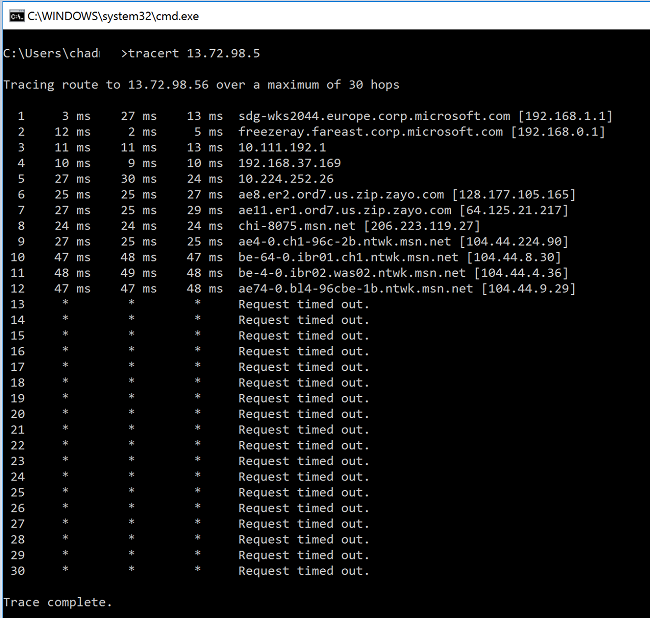 When you see DNS names that include "MSN" returned, you know you have reached the Microsoft backbone.